Jennifer Owen-O’Quill and I had the chance to attend the Valley Business Keynote in July in Harrisonburg, VA (my hometown—Go Blue Streaks!) Kim Scott was the keynote speaker and she wrote the NY Times and Wall Street Journal best seller Radical Candor. She did an excellent job and I wanted to share a few of her key points and my insights. I highly recommend the book for your own growth and to help your organizations grow stronger. 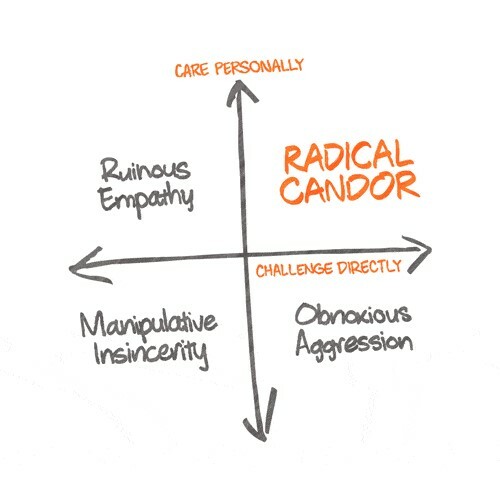 Your goal as a leader is to strive for Radical Candor. This is where you challenge someone directly with feedback (positive or negative), you care personally about the person and you are trying to help them achieve great results. Okay, I can hear some of my clients already not liking the phrase “care personally.” Let me get candid—get over yourself! No really, what Kim is trying to say is when you care about someone who works for you, you want them to personally succeed. You are not trying to be best friends or trying to solve their personal problems but you are trying to help them grow as far as they are capable. Also, if they personal challenges (and we all do! ), you are compassionate enough to recognize it and let the person know you do care about the person and not just the performer. What are the most important skills to do this? Listening, seeking to understand the other person, challenging the other person to make decisions vs. making decisions for them, being direct with feedback and connecting their role/performance to the vision/mission of the organization. Okay, sounds good so far. Why do we not do it more often? There are lots of reasons like time, we do not want to hurt the other person’s feelings, we do not really care about their feelings and we just want results. I would also propose that many of us have not really practiced giving feedback. Kim gives lots of good stories, suggestions and models in the book to help you with this. My challenge has been ruinous empathy. I have worried too much about someone’s feelings, self-confidence, etc. and not been direct enough at times in my career. The challenge is that in the moment it feels like I am being a nice guy and helping the other person. The truth is that my inability to be direct, keeps the person from hearing valuable feedback that would help them grow and succeed. They may not love hearing the feedback but if I deliver it with specificity and show that I care about the other person succeeding, then it is likely to be heard. If I avoid the conversation, then I might end up having to let someone go, with them never knowing that they were in trouble and that is a failure as a leader. We all find ourselves in all of the boxes from time to time. Obnoxious aggression is when you are direct but you really do not show you care about the other person. You may be more aggressive than you need to be, your tone may be too strong, you might belittle the other person or you keep them out of certain meetings, etc. What box is your challenge? What will you do about it? One last thought from Kim’s presentation is about positive feedback. It is interesting how much time we practice giving negative/developmental feedback. How much time do you practice giving positive feedback? I would encourage you to take a few minutes to practice your positive feedback next time. Concentrate on what the person did right, what behaviors did you like and what impact did this have on the business vs. saying great job on the presentation. Good luck and let me know what you are learning about your leadership style. Newer PostAre You Ready? Here Comes Gen Z!